Edgar Wright, Simon Pegg and Nick Frost return for the final chapter in their Cornetto trilogy, Shaun of the Dead, Hot Fuzz and now The World’s End. I heard about this film last year and I didn’t really know what it was about but knew who was involved and was really excited. Little did I know that the film was about a pub crawl that ends with an alien invasion, dear god a comedy alien invasion film is so my type of film! The trailer looks great and I have laughed quite a bit at the various jokes and I am sure it will be great, even the invasion looks great, and a skit of Invasion of the body snatchers but in Edgar Wright style love it. I can’t wait and neither should you, hope you enjoy the review and leave your extremely positive comments at the end. 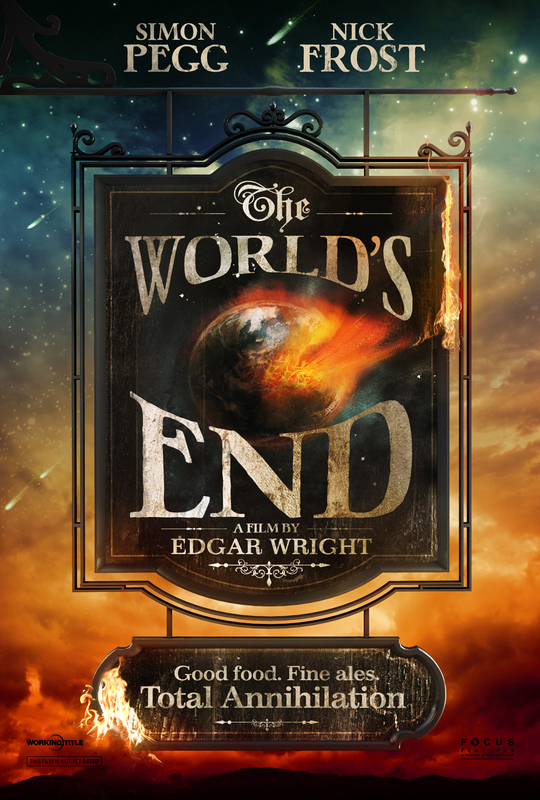 Five childhood friends reunite after twenty years to repeat a legendary pub crawl from their youth (which they originally failed) returning to their hometown once again to attempt to reach the fabled pub “The World’s End”. Over the course of the night, they begin to realise that the real struggle is “not just theirs but humankind’s”, and completing the crawl becomes the least of their worries ‘tonight we are going to get totally annihilated’. Weird shots of people standing still or staring are featured in all of the Cornetto films and I always laugh at it. It makes no sense and its crazy but I love it and really want to watch Shaun of the Dead and Hot Fuzz. This is the look people in my cul-de-sac give to anyone new in the neighbourhood. It’s so simple and yet so creepy! You instantly feel that these few guys are now alone surrounded by enemies and I think it will really add to the comedy scenes. It’s got that classic Body Snatchers scream face but with a twist BLINDING LIGHTS!!! That would be terrifying in dark woods but also when chasing Simone Pegg it’s so funny. Wow the visuals in this look surprisingly good! This is just an example but the whole trailer shows off some impressive CGI and practical effects. None of the other films have been over $10M so I doubt this will either. Oh you silly boys and stupid slap stick gags, I am one of those silly boys so give me more. Got to be quick when the aliens come to get you, those bastards move quick. At this stage of the trailer it’s moving so quick I don’t know what’s happening, but I love that for one random moment Pegg is just putting up two middle fingers. What?! At what point does somebody decide to use two stools to beat people up, I am laughing because I am assuming they must be drunk at this stage of their pub crawl. Frost you crazy fool. Hmm. I was kinda liking where it was going before the Alien’s showed up. I’m not saying it wont be funny, but the idea of the one friend trying to organize a pub crawl with his matured friends is quite interesting. Thanks, seriously?! You need to watch them! hat’s insane! Shaun of the Dead! There is nowhere you can hide! I really hope so, I doubt it will be bad to be honest, how could it when SOTD and Hot Fuzz were just amazing! As a fan of Shaun and Hot Fuzz, I definitely would watch this for the Wright, Pegg and Frost trio! I don’t know how different this would be from the other two, aside from the alien invasion part of course 😀 Some nice scenes you’re highlighting here Tim! This Is the End or The World’s End? How dare you Terence! You will love it! I like the way this is like Shaun of the Dead (with fighting the aliens, and also like Attack the Block with the blue-mouthed aliens) meets Hot Fuzz (with the something’s-not-right-here village). This can’t get here fast enough. Looks really good – kind of like Shaun, but with Aliens. I will have to see this one because the other two have been great. Nice review. The Riddick trailer is out. May I request a review of it please, kind sir? Looks great, Tim! After recently seeing Simon back in Star Trek 2, my excitement for anything he’s in went bonkers. I’m definitely going to see this, given that it’s going to have screenings in my area. It’s a British movie and in a year, even fingers in one hand are too many to count it. But I am still wishing for it to be played here. I love that they’ll have the fence gag (the third version of it) in this. Great look at the trailer, Tim.